The primary service of the Armenian Church, during which the sacrament of communion is administered, is called Divine Liturgy, in Armenian – “Badarak”. The service of the Divine Liturgy of the Armenian Church is based upon the missals of St. Basil of Caesarea and St. Gregory the Theologian. In the course of time the Divine Liturgy, underwent changes and additions in its celebration in the Armenian language; with special rites and original Armenian chants, it assumed a national character. It is divided into four parts, commonly referred to as Preparation, Synaxis (teaching), Eucharist and Last Blessing. During the Divine Liturgy unleavened bread and unmixed wine are used. The communion is given to the faithful in the form of the consecrated bread steeped in the wine. 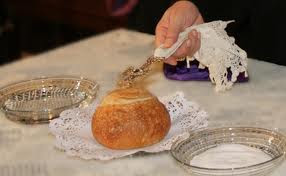 For each Liturgy only one consecrated bread is used. The priest can celebrate only one Liturgy a day. Only one Liturgy can be celebrated each day on the same altar. Those who do not receive the sacrament must partake in the Liturgy through prayer and especially unceasing remembrance of our Lord Jesus Christ. At the end of Patarak, “mas”, portions of blessed thin unleavened bread, is distributed to those who have not received the sacrament. Mas is distributed on one hand in remembrance of agape¢, which used to take place after the Divine Liturgy and, on the other hand in order that the faithful, who have not received the sacrament, should not be deprived of the blessing, but should have a sense of sharing in the Divine feast. Led by the candle-bearers and altar servers, the celebrant enters the sanctuary while the people sing, Khorhoort khoreen, “Profound mystery.” The “mystery” is Jesus Christ, the Son of God, who became a human being in order to fill us personally with his divine blessings, and with eternal life. The Divine Liturgy begins not in the elevated altar space known as the bema (khoran), but among the people. While the celebrant and deacon attend to the preparation of the bread and wine for Holy Communion, the other altar servers are busy lighting the altar candles and forming the procession to go around the church. The main reason why the curtain is closed at this point in the Liturgy is so that the people will not be distracted from their prayer and reflection by the liturgical housekeeping taking place at the altar. When the altar and the Eucharistic gifts have been prepared, the curtain opens and the deacons lead the priest in a procession around the altar and down into the nave. The celebrant offers incense to the main and side altars, the baptismal font, the sacred icons, and all the people. The people ask that the priest pray for them in the presence of Jesus. The procession marks the beginning of the Liturgy of the Word. The Liturgy of the Word concerns the Word of God, Jesus Christ. He comes to his people in the public reading of the Bible. Most appropriately, the Liturgy of the Word begins with a hymn to Jesus Christ, the Word, Meeyadzeen Vortee yev Pant Asdvadz [Only-begotten Son and Word of God]. The words of this ancient hymn express our conviction that Jesus Christ is the immortal Son of God. He became man by being born of the holy Virgin Mary, the Mother of God. He was crucified and destroyed death in order to give us eternal life. He is one person of the Holy Trinity. Since the Gospel contains the words of Jesus, the Son of God, it is chanted with great solemnity. The senior deacon calls everyone to attention by chanting Broskhoomeh, “Be attentive”. He takes the ornately bound Gospel book from the priest and elevates it high over his head. Lifting up the Gospel book is a sign of the authority of God’s Word over our lives. When we commit ourselves to the wisdom of the Bible, we find there a powerful source of meaning and direction. The Gospel reading is the culmination of the Liturgy of the Word. It is not read, but chanted from the elevated bema by an ordained deacon. The fathers of the Armenian Church emphasize that the solemn chanting of the Gospel during the Patarak is not only a lesson for our minds, but a real meeting with Jesus Christ. Another component of the Liturgy of the Word is the chanting of the Nicene Creed by all the people. The Creed is the official declaration of the principal doctrines of the Church. It was composed by all the churches at the Ecumenical Council of Nicea in 325 AD. As the Liturgy of the Word concludes and the Eucharist begins, the celebrant takes off his crown and slippers following God’s command: “Do not come near; put off your shoes from your feet, for the place on which you are standing is holy ground” [Exodus 3:5]. Just like Moses at the burning bush, the priest prepares himself to come into the presence of God. The Eucharist is the sacrament of the Lord’s Body and Blood, offered to those who have made a life commitment to God and sealed it in baptism. Like the Liturgy of the Word, the Eucharist also begins with a hymn to Jesus Christ. This first hymn of the Eucharist asserts that when we receive the Body and Blood of Christ in Holy Communion, we are being joined to the same Son of God who is praised by the angels in heaven. Another similarity between the Eucharist and the Liturgy of the Word is that both begin with a procession. A priest or deacon processes around the altar elevating the veiled chalice above his head. Like the procession with the Gospel in the Liturgy of the Word, this procession draws our attention and devotion to the bread and wine, which become for us the Body and Blood of Jesus. At the end of the procession, the deacon hands the gifts to the celebrant as they alternate verses from Psalm 24. St. Paul routinely directed the members of the Christian communities to “greet one another with a holy kiss” A ritualized greeting of peace and reconciliation is found in the Eucharist of all ancient churches. After the Kiss of Peace the deacons invite the people to give their undivided attention to the Eucharistic Prayer, the main prayer of the Patarak. In the course of this long prayer the celebrant, praying on behalf of all the people, asks God to do for us just what Jesus promised at his Last Supper: to fill us with His Body and Blood, the sacrament of His holiness and divine life, in the bread and wine of Holy Communion. The Eucharistic Prayer of the Church is attributed to the great fourth-century Egyptian theologian St. Athanasius, who strongly influenced Armenian theology. The Prayer is called “Eucharistic” because the story of our salvation in Christ pivots around Christ’s Last Supper. Theologians refer to the first part of the Eucharistic Prayer as the “Preface”. The Preface praises God for sending his Son, Jesus Christ, into the world to be born, and to take on the condition of humanity in order to cleanse it and reconcile it with God the Father. This is the mystery of Christ’s incarnation. We see the same mystery revealed in the bread and wine of the Patarak. The angelic song of the three holies known as the “Sanctus,” Soorp, Soorp, Soorp, is sung in the Eucharist of all ancient churches. When we sing this hymn, we are reminded of the extraordinary privilege of being a Christian. After the Sanctus, the Eucharistic Prayer describes “the outpouring of [Jesus’] infinite loving-kindness to us”. The Prayer recalls God’s repeated attempts, detailed in the Old Testament, to coax mankind back from the vain and sinful distractions of this life to the loving security of God. This culminates in the sacrifice of God’s only-begotten Son, Jesus Christ, who died on the Cross as a redemption for our sinfulness. “The world-saving Cross…the occasion of our redemption” is perpetuated for us in our celebration of the Lord’s Supper. The Eucharistic Prayer narrates this event, quoting Christ’s own words: “Take, eat; this is my body…Drink this all of you. This is my blood”. “Epiclesis” (eh-pi-clee’-sis) is the term theologians use to describe the next part of the Eucharistic Prayer. In the Epiclesis we call on God’s Holy Spirit to come down “upon us and upon these gifts,” so that they may become “truly the Body and Blood of our Lord and Savior Jesus Christ” This is our main supplication in the Eucharistic Prayer. After the Epiclesis, in the presence of Jesus Christ in his Body and Blood, we pray to our heavenly Father for all of our daily cares and concerns. The Prayer lists them one by one. These subsidiary requests of the Divine Liturgy are called “Intercessions.” We pray for peace in the world, for the stability of the Armenian Church, for our Catholicos, Bishops and clergy, for civil leaders, for travelers, prisoners, captives, for the sick and suffering, for temperate weather and sufficient food, for those who help the poor, for all the living and all the dead. The great Eucharistic Prayer ends with a final reference to Holy Communion, a closing doxology in praise of the Holy Trinity, and of course, the seal of all prayers, Amen: “And having cleansed our thoughts, make us temples fit for the reception of the Body and Blood of your Only-begotten, our Lord and Savior Jesus Christ, with whom to you, O Father almighty, together with the life-giving and liberating Holy Spirit, is befitting glory, dominion and honor, now and always and unto the ages of ages. Amen”. Two hymns were added before the distribution of Holy Communion. The first is addressed to Christ: Meeayn soorp, “The one holy”. It is sung while the celebrant elevates the Eucharistic bread and the chalice over his head. The hymn is an acclamation that they are the Body and Blood of Christ. The second hymn is sung in praise of the three persons of the Holy Trinity: Amen, Hayr soorp, Vorteet soorp, Hokeet soorp. At this point the curtain is closed. Behind the curtain the celebrant offers two personal prayers before he himself receives Holy Communion. It is an ancient custom in all eastern churches that when the priest celebrating the Eucharist receives Holy Communion, this should be done out of the sight of the faithful. In the Armenian Church Holy Communion is distributed in the following manner. The communicant stands before the priest, makes the sign of the cross and says Megha Asdoodzo, “I have sinned against God.” The priest then places a small particle of our Lord’s Body and Blood — the bread having been dipped into the wine — directly into the mouth of the communicant. The communicant again makes the sign of the Cross and steps aside for others to approach. After all have received Holy Communion, using the chalice to imprint the sign of the Cross over the communicants, the priest imparts the blessing of Psalm 28:9: “Save your people, Lord, and bless your inheritance; shepherd them and lift them up from henceforth until eternity”. In the early Church, the blessing above marked the end of the Divine Liturgy. There was no need for additional thanksgiving prayers since the Eucharistic Prayer is already the preeminent offering of gratitude to God for all of his blessings. The curtain is closed during this period and while the hymns are sung, the priest and deacons clean the chalice and paten, and return all the liturgical vessels to their proper places. After the final blessing the faithful come forward to kiss the Gospel book, saying, Heeshestseh Der zamenayn Badarakus ko, “May the Lord remember all your sacrifices”. The Armenian Church has daily nine (9) services. In the Armenian Church the night service is considered to be the first one, while in the Orthodox Church the first service is the evening service, according to the belief that a new day begins at nightfall. 1.Night Service is dedicated to the praising of God the Father. The service is offered at midnight. Sleep is a gift of God; we extend our thanks to Him for that blessing and ask Him that the rest of the night passes in peace and tranquility, and that the next day is spent in purity and righteousness. 2. Morning Service is dedicated to the praising of God the Son. The time of the service is at dawn; it symbolizes Christ’s appearance to the oil-bearing women and reminds us of Christ’s Resurrection and His saving mission. 3.Sunrise Service is dedicated to the praising of the Holy Spirit. Previously it was a part of the morning service. It symbolizes Christ’s Resurrection and appearance to His disciples. It is offered at sunrise and is identified with Christ’s Resurrection. Catholicos Ezr I (630-641) established this service and in the 12th century it was enriched with hymns of St. Nerses Shnorhaly ( 1173). 4.Third Hour Service is offered at 9.00. It is dedicated to the Holy Spirit and symbolizes Eve’s tasting the forbidden fruit and liberation through Jesus Christ from condemnation. The third hour service has a profound penitential meaning. 5.Sixth Hour Service is offered at 12.00. It is dedicated to God the Father and symbolizes Christ’s Crucifixion. During this service we ask for God’s help for our feeble human nature. 6.Ninth Hour Service is offered at 15.00. It is dedicated to God the Son and symbolizes Christ’s death and liberation of humanity from the power of the Hell. 7.Evening Service is dedicated to God the Son and symbolizes Christ’s burial. It is offered before sunset. On the threshold of night a Christian, tired of his work and of mental exertion of the passed day, asks God for a quiet night and a peaceful sleep. 8.Peace Service is dedicated to the Holy Spirit and symbolizes Christ’s descent to Hell and liberation of the righteous people from torments. It is offered after sunset. 9.Rest Service is dedicated to God the Father. In early times it was the continuation of the Peace service. It does not have a special meaning. It is offered before sleeping. In the evening– Evening service. on Saturday, Sunday – Evening service.